This easy Horseradish Cream is a common condiment at my house in fall and winter when fresh horseradish is in season and I'm cooking up the kind of hearty fare than benefits from its swift, creamy kick. Horseradish is a root vegetable, and it seems to like its own kind; if you like a bit of sharp, slightly spicy flavor, try it with your favorite meat-and-root vegetable meal. If you want some specific ideas on how to use it, the easiest and most obvious is simply where you'd serve horseradish otherwise: alongside roasted beef like prime rib (I've been known to plop a dollop of it on a grilled steak, too). I also like to serve it when I cook up hearty winter stews like Lamb Stew or this French Beef Stew. It also adds a nice little bump of flavor to mild, slightly sweet soups like Spinach Soup or Borscht. I'd hate to forget to point out how perfectly delicious it is on Latkes, or pretty much any other savory pancake or fritter (kohlrabi fritters and zucchini fritters are both excellent choices). You can even add a spoonful to baked potatoes, the potato-horseradish combination is such a winning one. If using heavy cream, beat it lightly first to thicken it so you can dollop it onto things. Not sure how to do that? Check out How to Whip Cream for tips. If you're using crème fraîche, you can whip that if you like a lighter texture. In a small bowl, mix together whichever cream you're using and the horseradish. Start off by adding 1 tablespoon horseradish. Mix everything together and taste. Add more horseradish for more kick. Serve immediately or keep covered and chilled up to 2 days. Note that the horseradish flavor will intensify as it sits. * How to choose which creamy base to use? 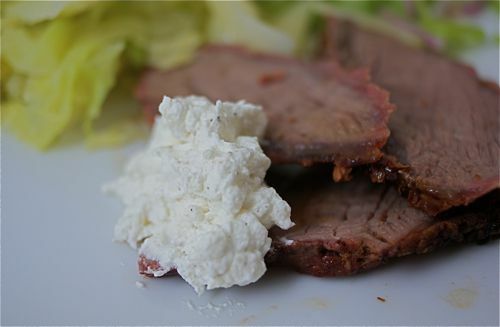 Sour cream is the most classic choice, its thickness dollops easily onto things, and its sour tang is a pleasant match with the sharp, sometimes slightly bitter flavor of horseradish. Crème fraîche is sour cream's French cousin, it's a little lighter, a little less obvious, and little more elegant; you'll find it in specialty grocery stores or you can make it yourself. Heavy cream, lightly beaten, will yield an altogether sweeter and lighter result. They are all good, each in their own way, so choose with confidence.